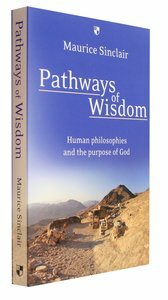 ^^With freshness and insight, Sinclair surveys a panorama of earthly wisdoms across the full course of human history, and around the world, to the present day. He helps us to grasp some principal ideas from key philosophers, without the intricacies or abstractions, and with a minimum of technical language. Throughout, he keeps in mind wisdom 'from above', from the eternal perspective of God's revelation in Christ. Taking the long view, the history of wisdom turns out to be 'his story'. ^^In this fast-paced and accessible volume, Sinclair's essential purpose is to encourage us to seek wisdom for love's sake - a wisdom and a love that are as practical as they are visionary - and to marshal the reasons for our hope in Christ. Maurice Sinclair is Honorary Assistant Bishop of Birmingham and formerly Anglican Bishop of Northern Argentina and Presiding Bishop of the Anglican Province of the Southern Cone of America. He is currently a faculty member of the Alexandria School of Theology, Egypt. He has been involved in missionary training for many years and has worked closely with people of different cultural backgrounds.